this year's MAPS program, probably representing two broods raised on site. 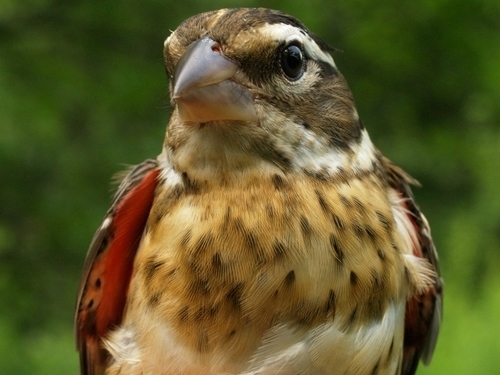 This summer MBO completed the second year of its minimum five-year commitment to operate a Monitoring Avian Productivity and Survivorship (MAPS) station. There are now over 1,000 MAPS stations across North America that contribute data, roughly half of which are currently active annually; therefore the statistics are useful on local, regional and continent-wide levels for research purposes and developing land-management practices. The MAPS program has two major management objectives: to determine the cause of population changes and to devise habitat management actions and conservation strategies to reverse population declines. 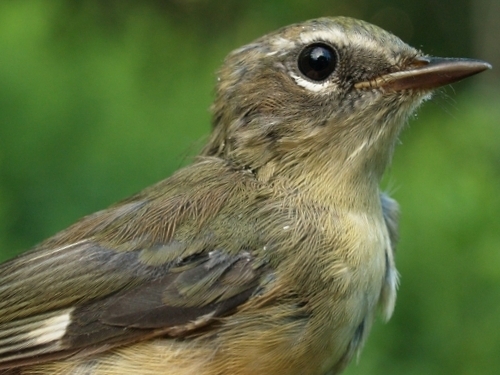 One of the highlights of the 2010 MAPS season was this hatch-year female Black-throated Blue Warbler, confirming it as a breeding species at MBO for the first time. The MBO MAPS station (MBOM) operates nine mist nets placed in a horseshoe around the southern end of Stoneycroft Pond. Banding takes place on a single day during each of seven ten-day periods between late May and early August. The first five periods coincide with the “adult superperiod” and the last two with the “young superperiod”. Following a general pattern, adults usually predominate in the catch during the “adult superperiod”, while young birds predominate during the “young superperiod”. To avoid conflict with our spring and fall migration monitoring programs that take place on the other side of Stoneycroft Pond, we ensured that our MAPS sessions this year were all within the traditional 'summer' window at MBO, defined as the 8 weeks between the two migration periods (i.e. June 6 - July 31). Eight of the ten most frequently banded species this year were also in the top ten list in 2009, although positions shuffled slightly. Song Sparrow moved from third to first place, doubling their numbers from 10 in 2009 to 20 in 2010. Black-capped Chickadee retained their number two spot – a very stable population at MBO. The numbers of American Robin banded remained constant (13) for each year; however their position dropped from first in 2009 to third on the 2010 list. 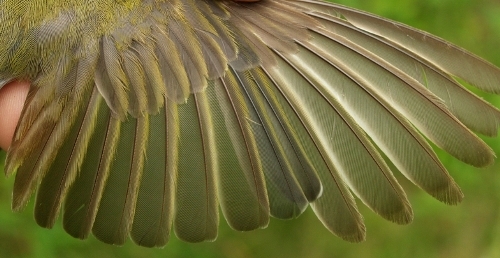 Red-eyed Vireos moved from ninth position to fifth, and were observed on all banding days. The new additions to the list are Red-winged Blackbird and Swamp Sparrow; only one of each was banded in the 2009 MAPS program. The two species dropping off from last year's list were Veery and Gray Catbird. In addition to operating mist nets, observers gather breeding evidence on all species heard or seen during each banding day. To date, MBOM has confirmed 27 species as breeders, with the newest addition this year being Sora, while another 9 are classified as “Likely” (some additional species on the MBO checklist are marked as breeders based on evidence from years prior to the start of the MAPS program). Five species are classified as “Transient” (species that breed in the general area of the station, but because of habitat or patchy distribution does not breed within the station area). Some species seem to prefer the habitat of the Morgan Arboretum, but zip down to visit MBO every once in a while. Tennessee Warbler is listed as “Migrant” as the station does not lie within the breeding range of the species. 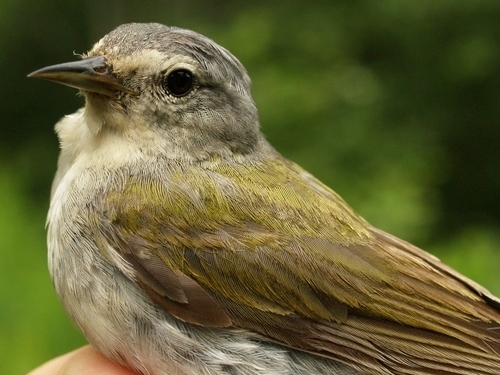 Both years now, MBOM has banded a Tennessee Warbler at the same time of year (July 25 in 2010, July 23 in 2009). Both were adult birds and good examples of a molt migrant. In most songbirds, adult migrants complete their fall molt on their breeding grounds, but Tennessee Warblers travel south from their breeding grounds and stop over at a staging area where they can complete their molt. Other notable summer highlights include the last banding session in June (June 27) when a singing male Blackburnian Warbler was spotted near Net M9, and the following session on July 5 when 15 American Crows discovered a Great Horned Owl sitting in the tree near the banding tent and relentlessly chased it toward the Morgan Arboretum. Along with the aforementioned Sora, Great Horned Owl and Purple Finch were the only species added to our cumulative summer checklist, which now stands at 97 species. Of note, this was the first summer that we missed Green Heron, Yellow-bellied Sapsucker, Eastern Phoebe, Brown Thrasher, and Brown-headed Cowbirds (all formerly confirmed as breeders at MBO), as well as Great Blue Heron. We look forward to our third season of MAPS in 2011, and encourage new volunteers to participate in the program. These two photos show an after-hatch-year male Tennessee Warbler that arrived at MBO in late July from breeding grounds further north to begin its prebasic molt. As the photo below shows, the molt had only just begun at this point, with only the first two secondaries being replaced to date.